(from Boardgamegeek) In the game Sanzen Sekai: I'd kill all the crows in the world to be with you a little longer, now titled Crows Overkill in its newest edition, players roleplay guests in a red-light district. Many birds gather in front of each player. The players must kill or move birds to prevent them from crying. If birds in front of a player cry, that player must leave the red-light district to go home (i.e. drop out of the game). The player who manages to stay in the red-light district for the longest time wins. Cards are drawn from both decks. 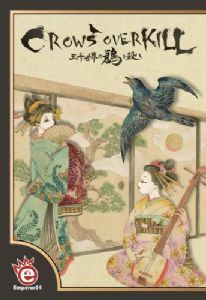 Birds are placed on the table in front of the current player, while shamisen cards go into their hand. Shamisen cards are then played to eliminate birds. A check is made against the time board to see whether the remaining birds cry and the current player is eliminated.